What if everything we believe about our sacred icons of American history turned out to be a complete lie? Suppose, for example, that The Father of our Country was actually a blood-crazed cannibal? 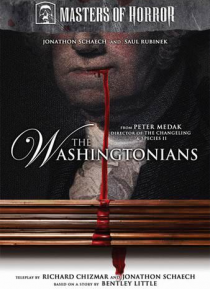 Jonathon Schaech and Saul Rubinek star in this gruesome tale about the discovery of a Revolutionary War artifact that proves George Washington's famed wooden teeth hungered for more than just liberty. Ho… w far will a group of homicidal historians go to keep a hero's grisly legacy alive? Would our government deliberately hide the truth to cover-up the meat of the matter? A feast of answers - complete with huge helpings of human carnage - will all be served at the final banquet of The Washingtonians.